Every week for Table Top Tuesday, we have some of the most gorgeous vignettes. So many really talented and creative people. I thought I would show you a few from this past Tuesday. If you missed any of them, you really missed a lot. If you don't know any of these lovely ladies and their blogs, I hope you will visit and discover their remarkable talent. Also, just a reminder of my giveaway to celebrate the 1 yr. anniversary of Table Top Tuesday. 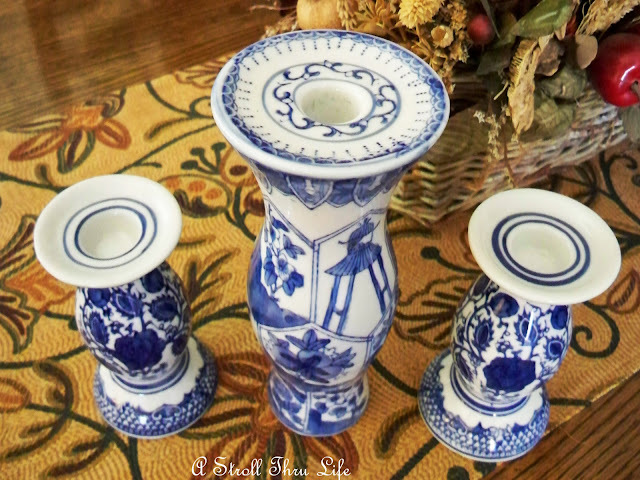 Don't forget to enter my giveaway for three lovely blue and white candlesticks here. Just leave me a comment to enter. Contest ends tomorrow night. The winner will be announced next week for Table Top Tuesday. Hope you are having a super day. Thanks for stopping by. Lovely vignetes. I'm getting ready to do one for spring. I'm inspired. Those are some gorgeous vignettes. Thanks so much for sharing. The blue and white are my favorites. Thank you Marty! I'm honored to be mentioned. I think my photo looks better over here! So many of the table tops are incredibly creative and beautiful. I love to look and gather new ideas. Hi lovely lady,You know I love blue and white sweet lady. I hope you come over to my [give-A-Way ]SWEET LADY. Lots of different approaches there, aren't they clever! Thanks to you I now have a lovely new header, which looks very professional. Thank you Marty and Mosaic-Maker. They are all lovely. I really like the white one, so different from my house but gorgeous! Hi Marty, Thank you for sharing these tablescapes-I haven't visited many of them so will pop over to see their blogs now. I love blue and white also. Thank you for sharing my friend. Thanks for sharing...each of them are beautiful!! I agree, totally. .. beautiful vignettes these ladies have put together! have a wonderful weekend, dear!